A jumpscare so loud that it reaches XVT:9,002 YdB (Yottadecibels). This attack does Alt damage. Can you understand this text: JgYygH7yY7ygftfg443ye3hhH398f. Thats a short version of the other text! 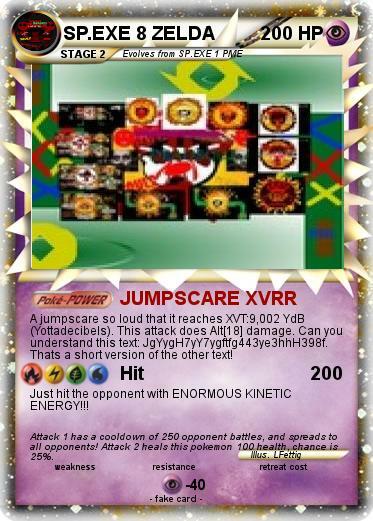 Just hit the opponent with ENORMOUS KINETIC ENERGY!!! Comments : Attack 1 has a cooldown of 250 opponent battles, and spreads to all opponents! Attack 2 heals this pokemon 100 health, chance is 25%.